Manufacturing quality wooden pallets and skids has been an integral part of our business since our inception. 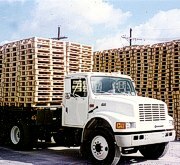 We specialize in custom manufactured pallets and skids. Because of the combined lumber purchasing power of DWP our prices are competitive and can save you money. In addition, we can review your pallet or skid design and make recommendations on less costly designs that will get your product safely to your customers. If your pallet and skid usage is large enough, we will come and build a pallet manufacturing facility in your town to ensure unsurpassed service, free freight, and bring jobs to your community.